Now days, many people know use the interfacing for garments or clothing. But most of them are not a expert to choose the available one. Today we’re going to share some tips to show how to choose interfacing for your garments. 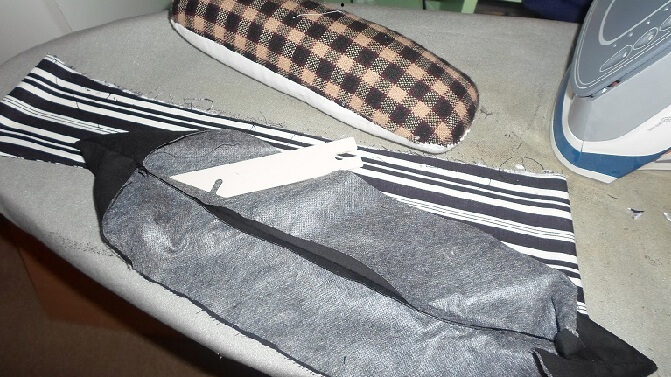 The purpose of interfacing is to add in garments. and it is used to keep the fabrics shape or keep them warmer. Often the first thing to decide which kinds of interfacing we should begin: woven or non-woven. Choose an interfacing which are more near to your fabrics, like color and touch feeling. If your fabric is stretchy, a stretchy interfacing should be your good choice. Remember to keep “like with like”.Whenever possible, use dark interfacing with dark colors and light interfacing with light colors. This is especially important under buttonholes. Interfacing are always hide in the garments of clothes, so the similar colors can also make it’s hard to be found. Though there are several kinds of different weight interfacing: lightweight fusible interfacing, medium weight interfacing and heavy weight fusible interfacing. No worries, hair canvas is significantly heavier than sheer silk, and would be inappropriate for this fabric, but would be perfect for a wool jacket. Remember to keep “like with like.” Using an interfacing that must be dry-cleaned with a fabric/garment that you intend to launder will result in heartache after the first washing. In summary, we choose interfacing based on the fabrics of garments. Choose the interfacing which are more similar to fabrics in color, weight and types. Keep “like with like”, we can choose the available one easier.